IS-2 at Lešany tank museum, Czech Republic. 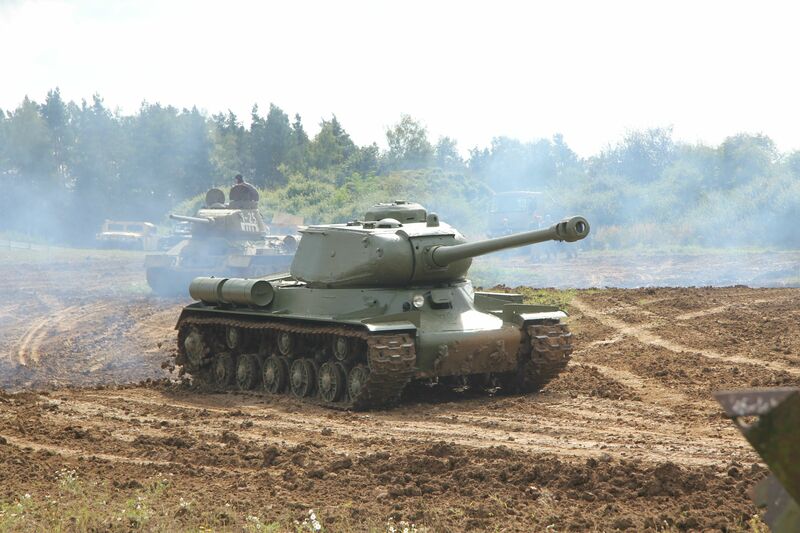 After the end of the war Czechoslovakia received 8 tanks IS-2 that were formed into the 1st Armoured Brigade. They were paraded in the May 1945 victory parade in Prague. They saw active service patrolling the Polish border until July 1945 and then they were transferred to the “Peace units”. In February 1947 they were stored as reserve tanks, but only 7 of them, the fate of the 8th tank is not known. They were stored until August 1958, were only 4 tanks are registered on the army register, the fate of the other tanks is not known (probably scrapped). The need for a larger gun for the IS-1 had in fact been identified by Kotin’s team and designers at Zavod Nr 9 in the wake of the Battle of Kursk in July 1943. This realization had two effects. First, production of the IS-1 with an 85mm (3.34in) gun was restricted until it could be equipped with a more powerful gun. Second, the 100mm (3.93in) BS-3 and 122mm (4.8in) A-19 guns were adapted for the IS-1 and put through firing tests during November 1943. The smaller gun proved to have the more effective armour penetration, although the larger one showed its potency by ripping the frontal armour off a captured Panther. Ultimately the 122mm (4.8in) gun was selected because there was a surplus of manufacturing resources for the gun and its ammunition, whilst the 100mm (3.93in) was in short supply. The barrel was initially fitted with a single chamber muzzle brake, but this was changed to two chambers after one of the guns exploded during testing and narrowly avoided fatally wounding Marshal K. E. Voroshilov. Not content with up-gunning the IS-1 design, Kotin developed the IS-2 with improved armour and mobility. The stepped armour glacis plate of the earlier design was replaced by a flat sloping type, giving better protection, but avoiding the need for thicker armour that would increase the vehicle’s weight. The new hull could withstand a direct shot from a German 8.8cm (3.46in) armour-piercing round at over 1000m (914.4yd), whilst its own gun could penetrate 160mm (6.29in) of armour at the same range, if its gunners could hit the target. Attempts to improve the turret’s protection had to be cancelled because the weight of the 122mm (4.8in) gun would have made it unbalanced. The possibility of re-designing the turret was turned down because of the cost and a lack of time. In reality, the IS-2 had several major shortcomings. The designers were aware that the IS-2’s effectiveness in combat was restricted by a slow rate of fire (just 2 or 3 rounds per minute) and stowage room for only 28 rounds. The former factor was partially solved in 1944, when an improved D-25T gun was introduced with a more efficient breech. Combat experience also revealed that the 122mm (4.8in) gun could not penetrate the Panther’s sloped armour above 600m (656yd), whilst splintering remained a problem for the IS-2’s own armour. Tempering the frontal armour to very strong hardness proved too complex and costly to introduce, and the deficiency was allowed to remain. Ironically, in late 1944 the difficulty in dealing with the Panther was partially, though unintentionally’ solved by the Germans. Shortage of manganese led to a switch to using high-carbon steel alloyed with nickel for armour plate, which made it more brittle, in particular along weld seams. This entry was posted in AFV, Armies by MSW. Bookmark the permalink.